Location: Seixo da Beira, Nr Olivera do Hospital. 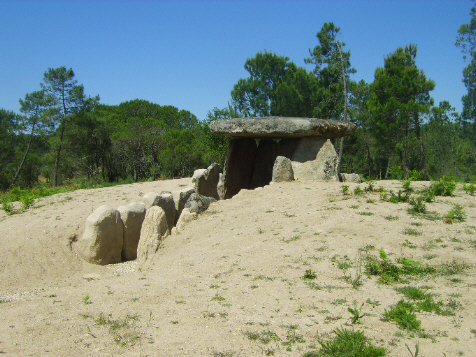 Grid Reference: 40˚ 28' 00'' N. 7˚ 48' 00'' W.
Anta da Arcainha: (Passage Mound). Even though this monument has been greatly restored, it still retains some of its former majesty. It is supported by 9 uprights around 3-4m high. The beautifully shaped capstone is around 0.3m x 3.5m x 4m, and still sits almost perfectly horizontal on top of the uprights. The site opens out to the south-east, offering a superb view of the Serra d'estrella mountain range. 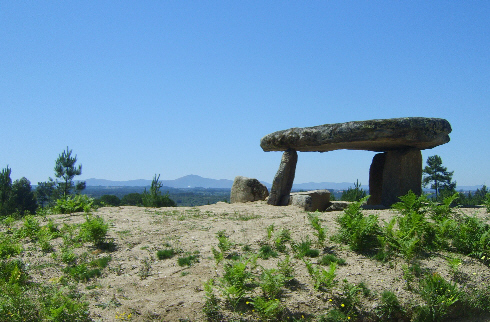 This dolmen is probably a peripheral structure of the Orca complex, on the other side of the River Mondego. 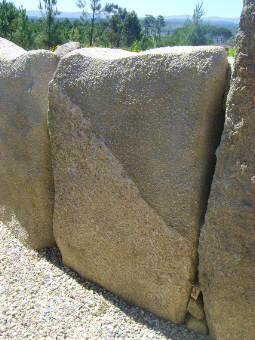 Some of the stones are the product of restorative work, and are actually moulded concrete. 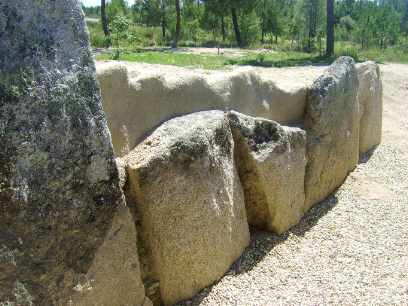 The restored stones of the passage. View of the Serra d'Estrella's in the distance.